My first connection with Tom was through one of our mutual publishers. We met at an author retreat in Grand Rapids a few years ago, where we had a chance to encourage one another in writing and family and ministry. I discovered Tom to be funny, warm, adventurous and a knock-your-socks-off writer. In fact, he’s so good that the Disney corporation hired him to be their on-site “writing guru.” He currently suffers for Jesus in Micky World, Florida! 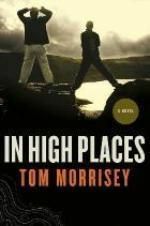 In High Places is a Christy Award finalist about the journey a father and son each take to deal with their loss in their own way. I hope you’ll take advantage of this great offer as an introduction to a wonderful author.